This figure shows a gradual increase in the number of racially or religiously aggravated offences recorded by the police over a 5 year period. This rise is explained by several interrelated factors: i) improvements in crime recording by the police; ii) increasing willingness of victims to report hate crimes, and, iii) in some periods, a genuine rise in hate crime perpetration. 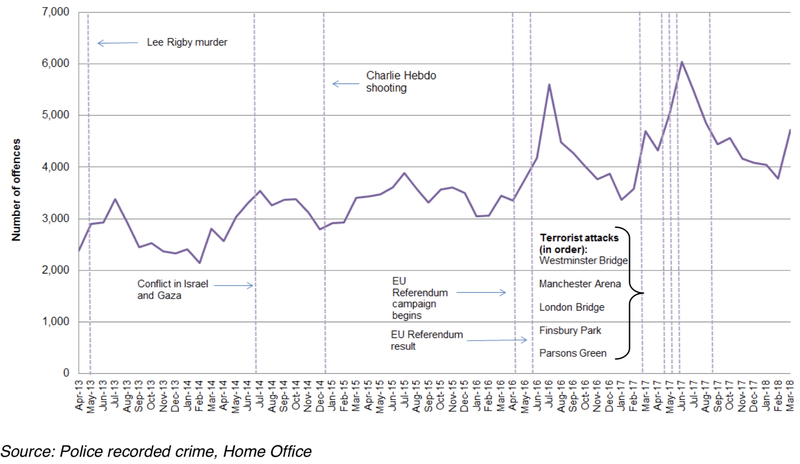 The spike in July 2013 relates to an increase in racially or religiously aggravated offences in the aftermath of the murder of Lee Rigby in Woolwich. Another significant spike emerges around the Brexit vote in 2016 (including the campaigning period). The highest spike since records began emerges around the spate of UK terror attacks between March and June 2017. The observable rise in the number of police recorded hate crimes in the UK has opened a debate on the contrasting picture painted by different sources of data. In 2017/18, there were 94,098 hate crime offences recorded by the police in England and Wales – an increase of 17% compared with the previous year. This continues the upward trend in recent years, with the number of hate crimes recorded by the police having more than doubled since 2012/13. In contrast, the Crime Survey for England and Wales, considered the most reliable measure of crime, has shown a consistent decrease in hate crimes over the past decade – from 307,000 in 2007-2009 to 184,000 in 2015-2018, the lowest number on record. This is in line with the decrease in general crime. However, taking between 3-4 years to report on hate crimes the CSEW fails to capture short-lived ‘peaks’ connected to specific events, such as the Brexit vote and terror attacks – effectively smoothing out the increases over the longer period required to produce robust estimates. An ONS analysis requested by HateLab restricted estimations to just race and religious hate crimes from April 2015 to March 2017 providing a more accurate reflection of the genuine rise in hate crime around the Brexit vote. Race and religious hate crimes increased from a 112,000 annual average (April 13-March 15) to a 117,000 annual average (April 15-March 17). This increase does not take into account the rise in hate crimes around the 2017 terror attacks in London and Manchester. The ONS does not deem the increase statistically significant – but neither was the decrease from 222,000 to 184,000 reported in Oct 2017. The new HateLab project Hate Crime After Brexit, funded by the ESRC Governance After Brexit programme, will examine all available offline and online sources of data to determine if there was a genuine increase in hate crimes around the Brexit vote.